We are playing mermaid. And wrap ourselves in light-bright outfits now, adorned with large-sized ethnic accessories. The only things missing are an innocent gaze and hair being played with by the wind. In both cases, we see a very common trend in ads or photo shoots for fashion and luxury services: non-White individuals may be included in the photo shoot, but they are not used to model the use of the product or service itself. As Ashley Mears argues in her ethnography of modeling, Pricing Beauty: The Making of a Fashion Model, non-White bodies are generally seen as incompatible with the idealized fantasy of inaccessibility and sophistication that is the guiding aesthetic for fashion mag editorials and advertisements for luxury goods. In these images, we see that non-Whites are included in a way that superficially increases diversity in a magazine’s pages, without disrupting the assumption that the imagined consumer — the subject of these images — is White. The unintended meaning of the second ad can also be summed up by the phrase, "adorned with large-sized ethnic accessories". It is sad to see this become such a pervasive trend. You forgot to mention that not only are they white but the are very young, tall and beautiful. Yes, they're all being "chaperoned". It's still very rare to see a POC in an advertisement who isn't pushed into the background by a white person. The Women of Color look much happier than the White Woman in the second picture. What was the purpose behind that? The unintended result of their smiles is that it implies their collusion in their own dehumanization. I assume the intended purpose is to suggest that whatever action being portrayed is a mutually beneficial exchange. Many ads portray people of couple as if their attitude is, "Oh we are just so eager to serve you" (my words). These ads normalize oppression, not only by marginalizing and accessorizing people of color, but also by suggesting that they like it this way. On this surface, ads like this may seem harmless because they are less overtly offensive than some others, but their subtlety makes them all the more hurtful. Thanks to Gwen Sharp for sharing this piece. The logic and implications behind such adverts (and the ads themselves) are truly repulsive - a repulsion fueled by, predicated on, and served to represent familiar historical narratives that continue to dominate societies founded upon pillars of racism, white supremacy, and settler colonialism. In our struggles against both the ideological and practical inequalities from which we suffer (and therefore all have a stake in ending), it is important to be self-reflexive and vigilant of our own words and behaviors so as to disrupt these narratives instead of perpetuate them. That being said, I hope Dr. Sharp will reconsider using terms such as "non-white." It sets up a problematic binary and implicit hierarchy between white/non-white and removes power and agency from those deemed insufficient (eg the 'nons') , as well as reinforces western exceptionalism. I'm thinking the images are photoshopped or the models' images are added to a background image later. It would be pretty expensive to set up real shoots like this. 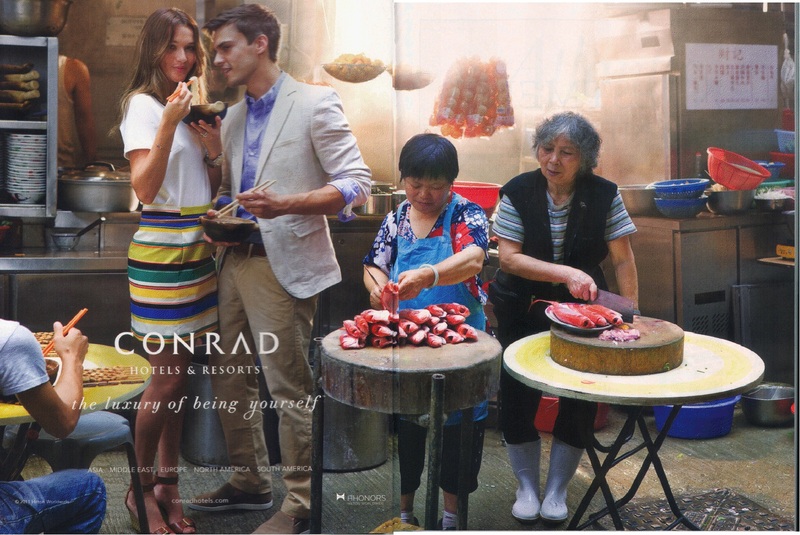 Note the total lack of any interaction between the models and the "locals," and the models in the Conrad image are disproportionately huge. Even if they are tall and the locals are stunted, the difference is still too much. This is slowly changing with the rise of the middle class in China, India and South America... though of course those numbers pale in comparison to the "slave class" which holds up to traditional stereotypes of nonwhites working in the background whilst the white takes centre stage, relaxing and enjoying. What is clear about this rise of affluence amongst nonwhite countries is that they are only perceived as affluent because they are adopting "white characteristics" e.g. clothes - suits, dresses etc. are normalised as being white - everything ethnic is on the fringe. Therefore you could say that the nonwhite world is using whiteness as it is the only way to "move up" in the world, or at least that is how they think. This further cements the white superiority complex that whites and nonwhites alike have. You have NO business whining about "centrality of whiteness" in European advertising. Europe belongs to white people, so they SHOULD be central there. Japan and Korea do the exact same thing in their respective countries' advertising, yet you aren't complaining about that; and we all know why the reason for that is. You might be able to complain about it happening in America, which liberals say does not belong to anyone, but Europe is the homeland of white people as well as a land that rightfully belongs to white people, and there is no good reason why they should have non-whites "model[ing] the use of the product or service itself".